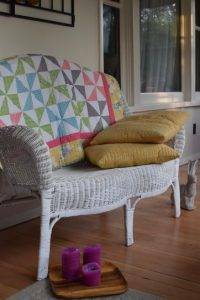 Making things from scraps that you normally throw away will help you take your sewing to the next level! Not only is it challenging, but so much better for the environment! 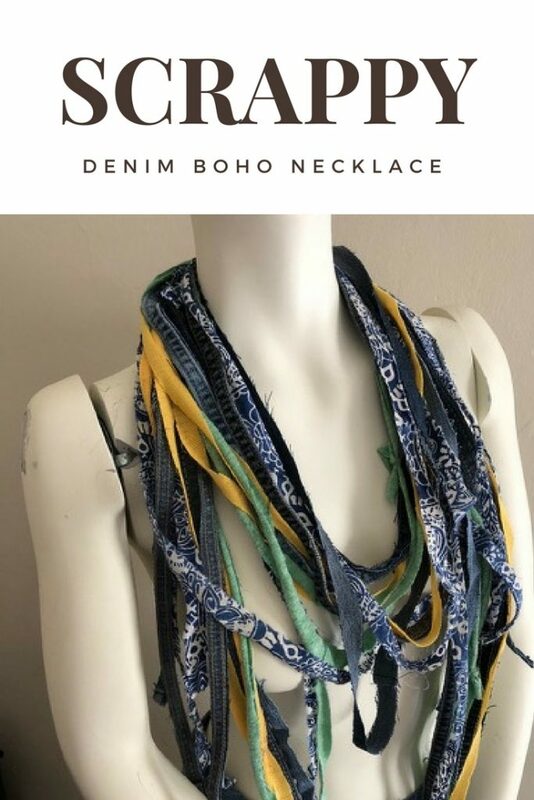 This Scrappy Denim Boho Necklace is a great project to use up odds and ends in your fabric stash. 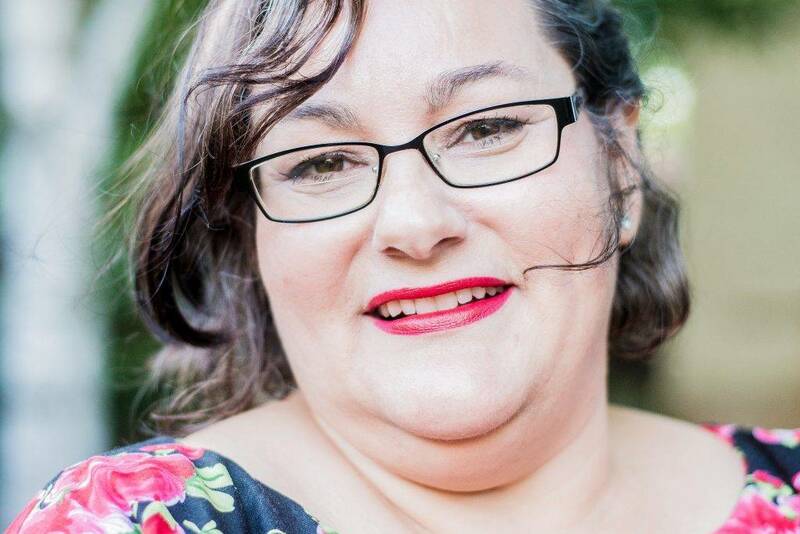 Hi, I’m Jessica! 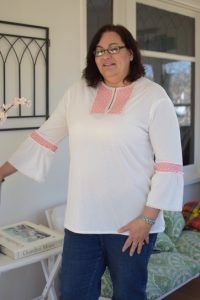 I blog over at Designers Sweet Spot.com (lifestyle blog) and I have a new sewing blog at Chambray Blues.com. Deborah and I are great friends because we both love recycling! I am excited to share this easy project with you today! I saw a necklace like this recently that retailed for $70.00. It was just scraps of material! Crazy amount of money to spend for a simple piece, so I decided to make my own. 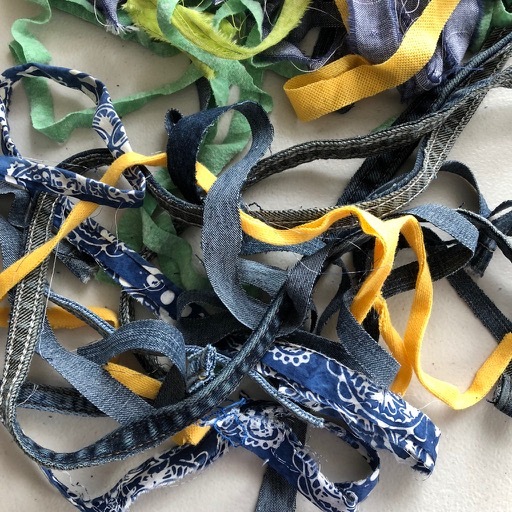 Cut pieces of denim into 1/2″ wide strips. I used the double stitched seam from several pairs of jeans in different colors. Cut the fabric close to the seam edge on both sides. 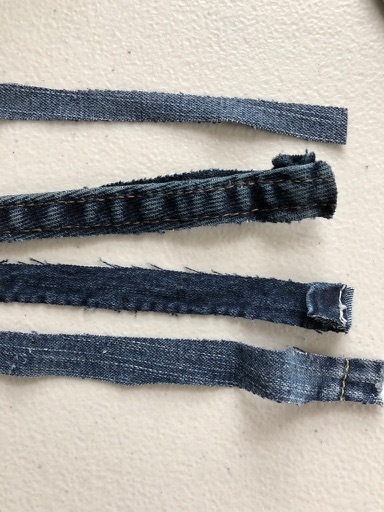 Cut additional strips of denim, about 1/2″ with a scissors or rotary cutter. Cut strips of t-shirts or jersey fabric 1/2″ wide. 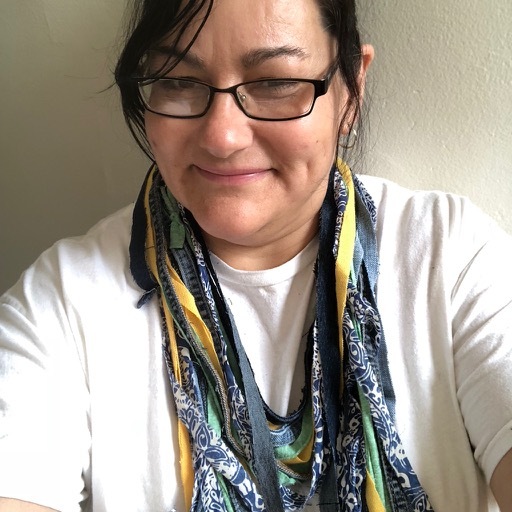 If the t-shirts are printed it’s even better because the print will add more color to your necklace. Strips can be in any length. 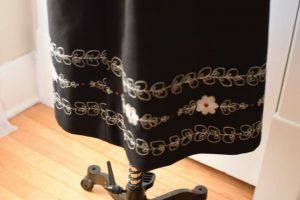 Cut strips of one print fabric into 1/2″ wide pieces. These should be roughly the same length as your other pieces. Pile all the pieces together and look at the colors. You can add or subtract the colors as you wish. Design your necklace on a form or on yourself while looking in the mirror. 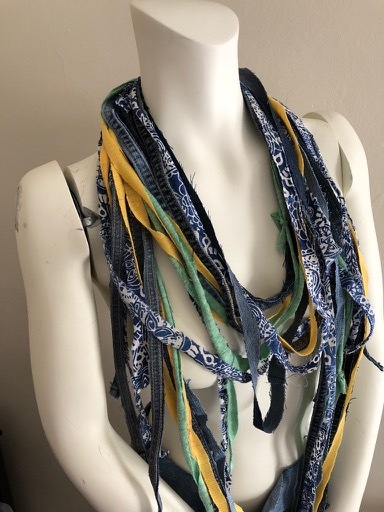 Design your necklace by draping pieces of fabric around the neck of a dress form or on yourself while looking in the mirror. I recently rescued this mannequin from the trash and she has come in pretty handy for this purpose! Some of the shorter strips of fabric were tied together to make longer circles to drape around the neck. 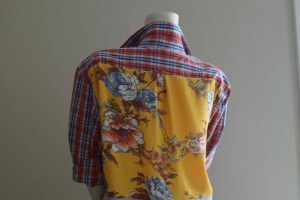 You can tie the t-shirt or knit jersey pieces of fabrics together and trim the ends as needed. 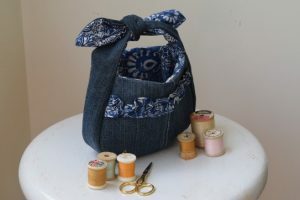 Sew some of the ends of the denim fabrics together in circles to reduce bulk instead of tieing them if they are too thick. Layer the pieces around the neck in a circular fashion and down either side of the front neck until you achieve the look you are after. Pieces can be trimmed in length as you wish. My necklace has pieces that drape almost to my waist. Use one piece of jersey or t-shirt material to secure all of the loose pieces together at the back neck. 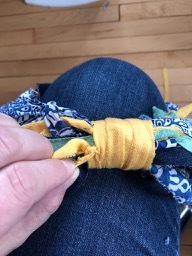 Tie the wrap piece on, twist it tightly around all of the fabric strips and make a knot to finish. Trim the ends and hide the knot under the rest of the fabric. 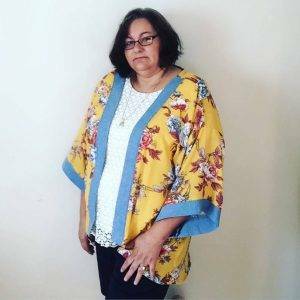 You are all set to wear your creation! 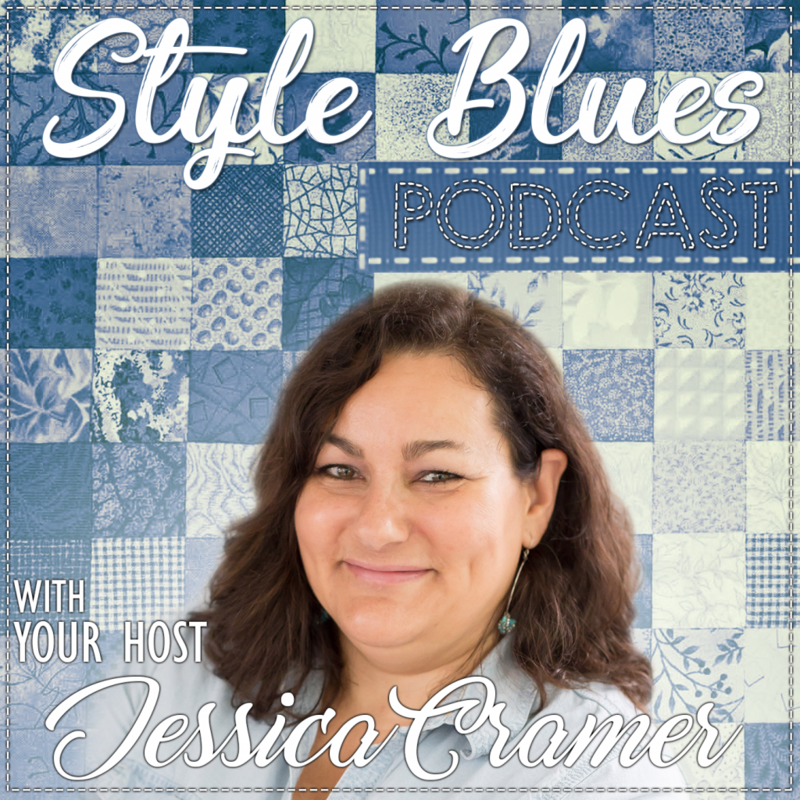 Thanks to Salvage Sister and Mister for having me post today!